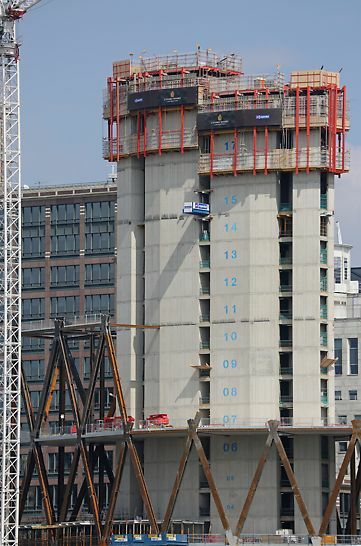 The irregular-shaped concrete core comprises 500 mm walls on the lower floors reducing to relatively thin 225 mm walls as the building grows in height. The change in wall thickness coupled with irregular angles rendered the real challenge of the structure. Developing a strict yet consistent pour and jump cycle was critical to enable the subsequent steel, intermediate flooring and cladding operations to commence. Careful coordination was also required to ensure the scheduled cycle time of 5.5 days was achieved on the core. Optimising resources and productivity were essential to keep the project on track. The core was jumped in two halves. 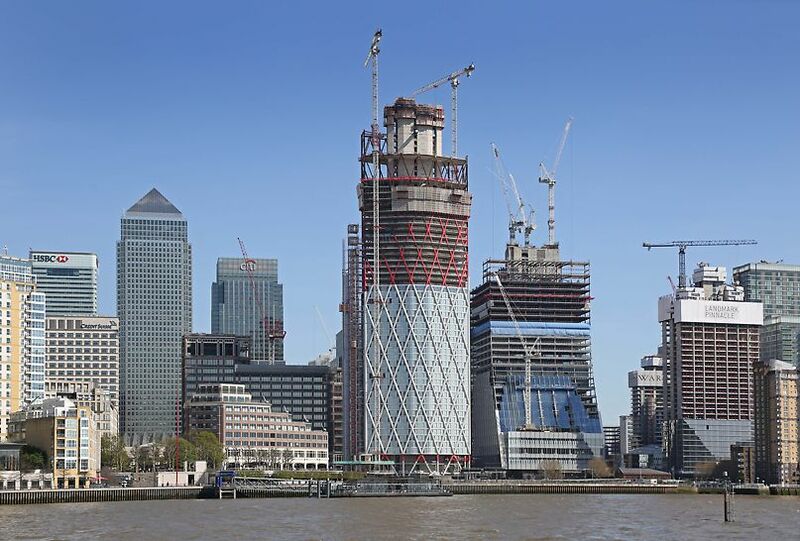 This allowed labour resources to progress the concrete pour on the second half, whilst the steel reinforcement installation process occupied the first half. 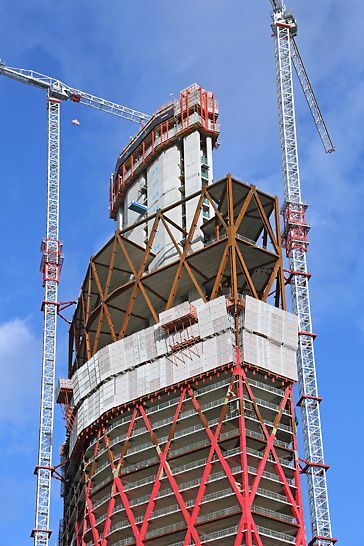 ACS-P was installed on the two inner core structures with the system supported by two opposing walls, providing the foundation for facilitating the climb. The system was integrated with large load bearing platforms designed to take the weight of a concrete placing boom in addition to live load. 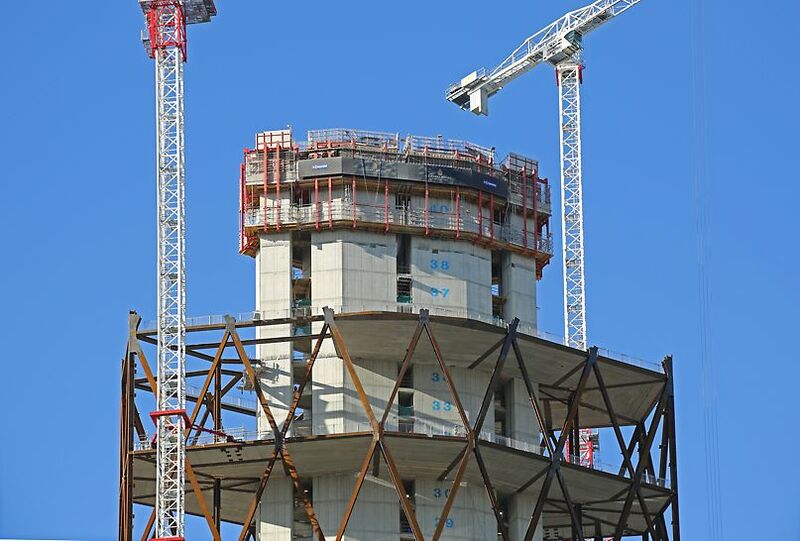 The two outer cores were climbed using ACS-G, a system anchored from one side of the structure yet capable of supporting formwork on both sides. 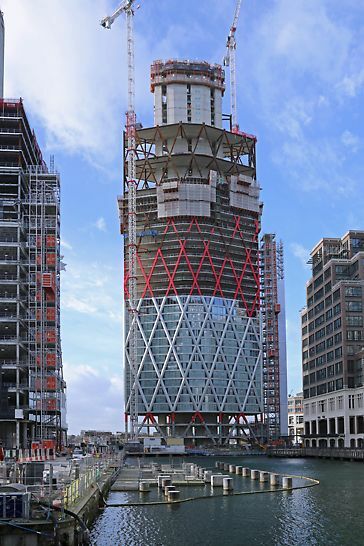 Both ACS systems were compatible with the erected steelwork, as PERI were able to manoeuvre the system around the fin plates at each precast floor, ensuring that follow up trades were seamless. TRIO panel formwork system integrated with ACS to ensure geometric consistency throughout all pours.